KWVR marks 60 years since closure of the GN line. 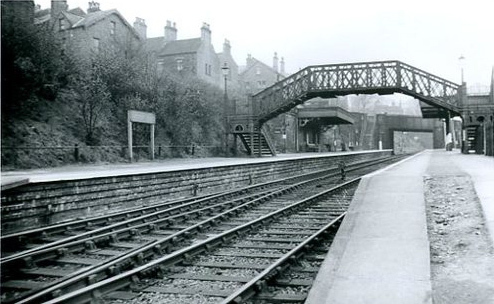 In a year of anniversaries, there is one that precedes the current preservation movement by 10 years – the closure to passengers of the Great Northern route to Bradford and Halifax via Queensbury 60 years ago. Editor of the Facebook Page, The Queensbury Lines, Mark Neale, is the organiser of an exhibition to mark this significant event and sends this contribution to the KWVR website. In one of the very first issues of the Worth Valley Railway magazine `Push & Pull` the late Bob Cryer described the former GN line from Keighley to Bradford and Halifax via Queensbury as a “remarkable railway”. In May 2015 it is 60 years since this “remarkable railway” carried its last regular passenger and this is going to be marked in several significant ways in the locality. In the 1980s I was part of a small group who together with Bob investigated the possibility of buying Thornton viaduct for £1, but we realised that purchasing it was only a small part of the story, as any liabilities for its maintenance etc would have come with the sale. Slowly over the years the GN line has reverted back to nature, with trees and undergrowth taking over much of the route, and in the inner city Bradford district much of it has been built on. However it has never really been forgotten and has gained an almost ‘cult’ appeal to some enthusiasts. The Facebook page has attracted a lot of interest much of it from outside the Bradford area and even overseas. It has attracted 500 ‘Likes’ and is regularly accessed by people from the Bradford, Keighley, and Halifax area, but also from people in Italy, USA, and even Thailand. It is designed so that people can contribute long forgotten images or stories about the line so that they are not lost forever. I have run a few small exhibitions in Clayton and Queensbury libraries some years ago which prompted local people to bring forward some valuable material, but as 2015 is 60 years since the last passenger train ran, I decided to try and mark the anniversary with a bigger event. 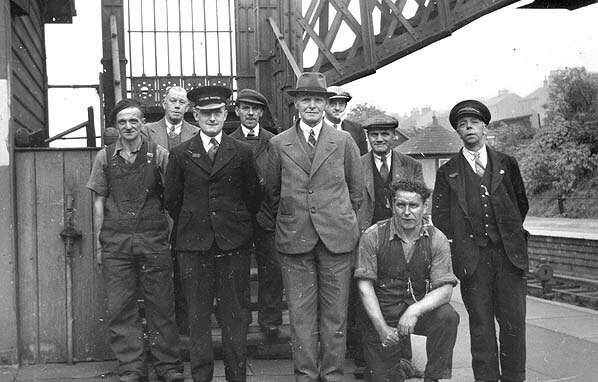 Saturday 23rd May, 11.00, will see the opening of an exhibition in the Museum of Rail Transport at Ingrow station which will run for approximately 6 months. The line was built by Benton & Woodiwiss, a major railway contractor in the Victorian heyday of railway construction, and the company moved into this area when their contract on the Settle-Carlisle line finished. Two descendants of Woodiwiss are going to be at the formal launch of the exhibition having travelled up from Devon and London for the event. They have never met before!! The exhibition hosted by the Vintage Carriage Trust will feature many artifacts from the line including a marked chain stamped with Benton & Woodiwiss used to survey the line during construction. In addition the two GN coaches from the VCT collection will be near to the exhibition within the museum showing typical examples of the kind of rolling stock used on the line during its early days. They may have even travelled over the route. To further mark the anniversary, Worth Valley trains will carry a replica headboard `The Economist` as carried by the GN trains on the final day, 23rd May 1955. This was made by the station master at Thornton, Bernard Whittaker who at the time was the youngest station master in the country. This was a reference to the supposed £40k per annum that the line was said to be losing and one of the reasons given for its closure to passengers. Nowadays part of the route (Cullingworth to Wilsden and Queensbury to Thornton, both including the viaducts at Thornton and Hewenden) are part of the expanding Sustrans managed cycleway and footpath. The Great Northern Railway Trail has become a valuable resource in the area. There are even proposals to extend the route through the lengthy Queensbury tunnel. In the Ingrow area, Ingrow East station is unrecognisable as a builders yard, adjacent to the KWVR Ingrow West station whilst at GN Junction the base of the signal box is still discernible from the train. I very much look forward to this exhibition. My guess is that Keighley is one of the few stations in preservation that hosted two different railway companies(MR/GNR, then LMS/LNER), and the two stations at Ingrow so close together must have been fairly unusual too. The Roger Griffiths/John Hooper book, ‘Great Northern Railway Engine Sheds 3, Yorkshire and Lancashire’, has an interesting account of Ingrow Locomotive Shed, the engines based there, and the sort of freight traffic that worked out of Keighley GN to distant parts. Mark has put a lot of work into it, so should be very interesting.